A mere… five weeks after setting the goal to finish the sleeves on my Lee Target cardigan, it’s done! Knitting the back and sleeves as one piece seemed like a walk in the park when I first looked at this pattern, but in reality it was a slog. As a result, my enthusiasm for this project has waned since first starting it. So much so that it’s taken me two weeks since finishing the back to actually write about it. The upside to spending so much time on the back it that I now know the stitch pattern quite well. The long rows were the equivalent of writing “I must not forget ‘*KB, K2, KF, P4′”; hopefully I won’t have to reknit as many rows in the remaining sections of the cardigan. Also, the other sections of the cardigan are much smaller, so no more 200ish stitch rows. I’m now seeking solace in my other project, the tri-cable cardigan. It seems somewhat backward to consider a cabled 4ply cardigan a holiday in comparison to an 8ply cardigan, but I’ve never claimed to be rational; in fact, I’m really taken aback by how tiring I’ve found working on the Lee Target cardigan to be. 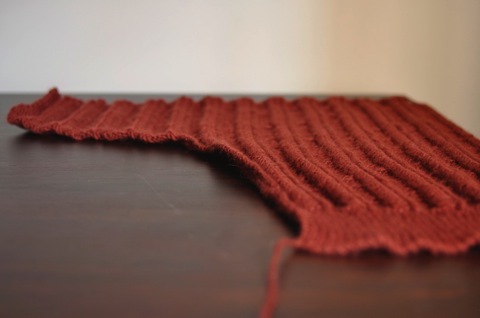 Hopefully working on the tri-cable cardigan will provide enough R & R to get back on to it soon. Who knew knitting could be this mentally taxing? 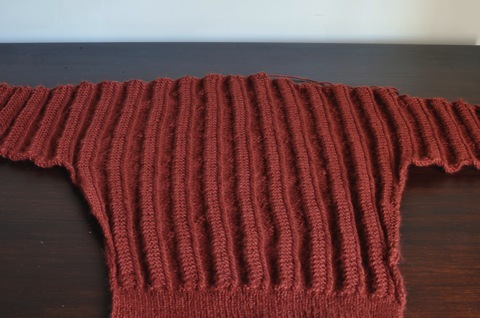 Do keep going with this on…..it is lovely both the design and the wool….you know you will love it when done!